Hooves traced a well worn path on their route towards the herd land. Their heads rested north as they shuffled through the snow and Ricochet was forced to shield his eyes against the wind that blew from that way. Bowing his head against the cold he tried to position his body ahead of her, providing a physical shield from winter's teeth. To their left the sun had started to decline in the sky and soon promised to sink in the horizon line, likely bloodying the sky by the time they crossed the herd borders. The trip would not be terribly long. Of all the herds she chose it was fortunate the Foothills was the nearest, especially in this turn of the year. It led his thoughts to wonder what had set her hooves to travel in this season, and to what darkness the depths of her past settled. He tossed a glance back at her as they walked, wondering if she would be as willing to tell as she'd said she be. She seemed almost amused by the idea of telling him about her previous residence and its foreign culture of mare subservience, an idea Ricochet thought he would enjoy. He supposed that enjoyment was the source of her amusement. Flicking his tail absent, a dark wash against a pale coat, the dunskin tried his hoof at sparking meaningful conversation. The dribble at the Threshold had only been a game and he needed to know the true worth of his latest recruit and how best she might serve him. "I would have thought that mare's proposal would appeal to you... could it be that you enjoyed the lack of options provided to you before? I would call it security in the familiar, but I'm not sure you'' recognize much of anything here." His voice was a casual drawl even if the topic was a serious affair. He only hoped to test the waters and poke at the edges to see what might unfurl from the heart of it. Her tone of response would be the most truthful and he turned his ears towards her in ready hunger. Touched by time, the land around me seemed to rot slowly away into the withering meaning of life. My mind wandered from the present and found itself strangled in some sort of hideous parallel. So many tears, so much agony gasping from the lungs of nameless prospects that had been blown away by merciless flames. I was beginning to forget exactly why I had come here today; I wasn’t sure if I could ever simply exist anymore. It was almost saddening in which the way I carried myself for there was no more light, no more power behind such a graceful stride. Perhaps I was destined to discover the endless process that existed around us; life, death and the repetition of each vicious cycle. Somewhere within myself, I was breathing a sigh of relief, thanking fate for another day of pure observation- total life. I was but another pawn in this savage undertaking; check mate, you lose. Bitter remembrance of another time seemed to overwhelm me. However, I was unsure of where these memories had commenced. They clouded my vision like a deathly veil, unraveling the certain truth that reckoned with those blackened shores. Avalon was certainly none like this place and in ways it was a relief, but in others I felt strangled and pressed for air. I had lived once, just a young filly before I had met my fate whose dark eyes did wonders on my heart. Had I just stayed by his side, I would have been his Empress, two dark reminders of the hell that controlled the lands. We were certainly a pair to be reckoned with and yet I chose to go. Whatever had derailed me was obviously something I could not call upon now because the meaning was lost to me. It’s as if I had found something so dear to me and feared it would also be my demise and fled. Whether this was a natural reaction, I wasn’t sure, though something told me it wasn’t. I had spent nearly a year travelling a nomadic route to nowhere and found my head pulsing with thoughts of home, of Avalon, and mainly, of him. However, my return was not looked upon so merrily. I had come back to find hurt and anger in those eyes that had once seen me so treasured. But this was now the least of my worries as I had come home to face the ruin of not only the ones I loved, but the place I had taken refuge. Avalon had been buried in ash, everything blackened in thick coats of the past. Lives had been lost and many wandered about aimlessly searching for the dead that would never answer their anguished calls again. My whole world had fallen from the heavens into hell where I knew my soul would remain, lost with those that had been taken and more importantly damned by the King who had watched me walk away in his desperate time of need. If I had stayed, would this have happened? I felt like the world had been dropped on my shoulders, hurt and confusion striking me down into a pit of despair even if I had survived. Was I meant to walk this earth still more after all I had seen, after all I had done? Being lost in such reverie had brought me back in mangled pieces, blank and unsure of what had come over me. All images of what was, had passed, retreating once again into the atmosphere like the wind that now brushed gently against my face. The wintry freeze laced my breath in frost and I cast a weary glance to Ricochet, who until now seemed a ghost to my private affairs. His polite gestures were lost to me though, as I had long since been numb to the elements, drawn away from such minor worries as the surreal story of my life replayed in my head. He was so inviting to me, perhaps because of his youth, because of his life and I valued this in a companion of any sort. He was a truly extravagant creature and at time I felt compelled to his presence for the mere beauty of him. The Threshold disappeared behind us as we now neared the Foothills and I was eager to lay eyes on what icy wasteland I was next to call home. “I am lost to the customs that have been presented to me, but I am an adaptable creature as many of our species appear to be. Females were offered a choice in Avalon, but in multiple cases, mares were considered powerless and therefore unable to make their own decisions. Depending on the nature of the male one encountered, she may or may not be allowed to follow willingly. Otherwise, brute force was used to gather her back to the herd lands.” I was calm in admitting this strange habit adopted by those in Avalon, because to me it was natural, it was right. I had never been forced to adhere to such requests but I had seen it done many times. Perhaps it was a sickening tradition, but mares often had the tendency to claim hatred for males, yet travel to the claiming grounds to seek their assistance and throw a fit after their arrival. Looking back to my guide, I wondered about his history as well. If this was intended to be a session in which we shared, perhaps I would take my turn as well. But I wouldn’t interrupt him should he desire to know more. Instead I would wait my turn to question such a shadowed creature with secret intentions dancing within those turquoise eyes. When next Ricochet looked upon the mare her eyes had taken on a haunted look. The Incendiary knew better than to prod her so carelessly in such a state, so he let them walk on in silence, wondering what images flashed in the backs of her eyes. Were they horrible scenarios that gave her feet to flee in haste, uncaring where she stopped and only doing so when exhaustion stole her, or was it with a longing sensation of loss that filled her with equal parts joy and sorrow? 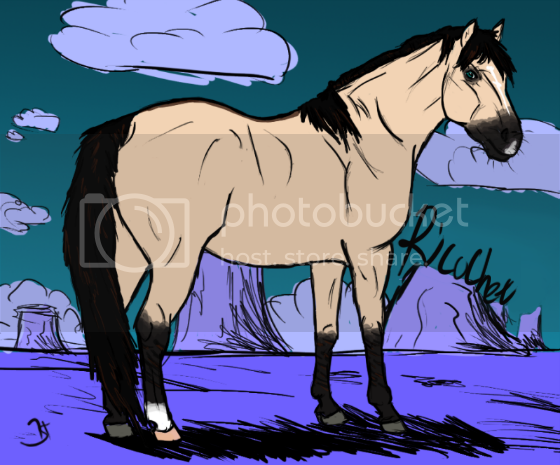 Ricochet had experienced both, of the same land, but now he thought little of his past. There was too many atrocities, sorrows, and loves in the present to keep him preoccupied. Whatever spare time he could manage he used to look into the future, rather than back to his previous life. There was nothing left for him to see there, he'd already tried that once. When Insanity began to speak Ricochet shook his head, tossing away his own memories and turning an ear to hear of hers. He was surprised to learn mares did have a choice, but often willingly forfeited it. He couldn't imagine anyone doing that here. In many ways this land was his birth pace all over again, just different names, different settings, different horses. The familiarity of it perhaps gave his heart the ease of forgetting. "Were there wars?" Ricochet asked after a moment of pause, his head turning to glance at her, steady eyes focusing on her expressions with a gentle interest. "Were there thieves and kings, fools and murderers?" He wondered much of the outside world, not having been too far past these borders. One day he hoped to march into the beyond places and claim them too, but for now he was busy enough with this spit of land. "We had all of that where I come from, and here now too." He ducked his head as a tree branch that hung low cropped up in their path. The gentle needles on his skin prickled his hairs and reminded him of the shades and their cutting flesh. He shuddered. "It was overrun, my home, Isilme. The dead began to walk again, and though their faces were familiar, their eyes and actions were not. Their bodies were made of shadow and blood and they cut when they touched and chased you until you died." Ricochet spoke evenly, unperturbed by this information that he had long ago accepted. "If you fought, you died. If you ran, you died. We had only the hope of sealing them away by gathering some items, to make a spell or something... but we failed." He exhaled heavily, an unhappiness tainting that memory. The Tome Guardian that had set them on the missions had been an idiot and in the end he was powerless and killed too. He had promised them salvation but he did not deliver it and everyone had suffered. "Everyone blames it on the wars that filled Isilme. It was said to be a greedy and racist nation, yet I wonder which is not? If the gods wish our hearts not to be filled of spite then I wonder why do they fill it thusly?" Ricochet laughed, bitter and disbelieving of gods and fates and peaceful gits. "It's interesting though that this all happened in a time of peace... I think we have to have war. Even those who fight for peace often do it with their hooves and teeth, such hypocrites." His tail lashed angrily at his flanks, the cold making it sing more than usually but the bite sharpened his wit. "I do not fear the dead or take thought from the past. What is done is done and failures are only ever that... I will not be caught in such a position again." She was quiet for a time, simply pondering everything not only in front of her but everything already behind her as well. Ricochet was a kind companion, one that she had not expected due to his previous behavior in the Threshold. He had intrigued her then and continued to do so now, as he possessed and ever-shifting personality. She supposed that when he was faced with a challenge to bring her home, he had thrown all of his cards on the table and now he was simply basking the glory of his small victory. However, her thinking was interrupted as his masculine tones bit the silence that had proceeded between them. It was a question of war and the word was bitter upon her tongue. Of course there had been war in Avalon. A constant conflict between the Lights and the Darks, Kings and Queens, Males and Females; it was all prevalent in Avalon simply because it could be. “There was most certainly war in Avalon, however simple-minded it was. There were Kings and Queens, fools and the occasional murderer. However, there were no Gods there… just the righteous guidance of the hierarchy.” She smiled a bit as she remembered the fact… No Gods. Here in Helovia, the Gods were vitally important to life and magic and rank. It was so strange to imagine a world strictly based on an ultimate power from the heavens, but she knew that she would eventually grow accustomed to the idea. The cold wind had started to press in against them again and this time she allowed herself to accept Ricochet’s earlier gestures and slowed to walk close to his flanks. She nudged him slightly to make him aware of her intentions and urged him to continue to the Foothills. As he did, she listened to him speak of the wild lands of Isilme; it was as if he had come from a fairytale that had been tainted with darkness and she pitied him for the fact. “How can such a place bear the title of home? I believe that any war, any conflict, or any spite raised in the name of the Gods cannot be thought true. We are the only ones who can control what happens to one another. If war is desired, than we should make it happen. If it is not, then we have power to resist it…” She was calm and nearly passive but her heart beat with meaning; war was not the answer to any problem by any means. However, she did chuckle at the humor in the idea because she knew just how it felt to be controlled by thoughts and opinions that she did not share. “War is never needed, as I feel it can always be avoided, but I am not opposed to fighting for a great cause should it ever arise. But I guess you could call me a selfish creature because I’ve been approached with many invitations to battle and chose to ignore such due to insufficient cause.” She looked at him now, both beasts clearly opposites and yet the same. Both shared an avid passion for life, for existing in the mere purpose of accomplishing themselves, but both going about their values in two separate ways. I have no time, am placing Ricochet in absent abyss and playing as if the Gray chased him off. At this time I cannot continue this thread, we can assume they arrived at the Foothills, but since there is no future with Ricochet heading the empire, I'm not sure if you'd like Insanity to stay in the Foothills, become Outcast, or maintain the empire plot regardless of Ricochet.